Explore the artist's creative and spiritual home. Frida Kahlo was born July 6, 1907 in Mexico City, though she would later tell those who asked that she was born in 1910, the 100th anniversary of Mexican independence. From the start, Kahlo allied herself with the political moment of her country and her city, creating an identity deeply grounded in her surroundings. Growing up during the throes of another political revolution as rebels sought to overthrow a 30-year long dictatorship, Kahlo's style became strongly defined both by her political moment and the decorative influences of her native neighborhood of Coyoacán. She spent most of her life in Coyoacán, and much of that time in the same house, which has now become the Museo Frida Kahlo. 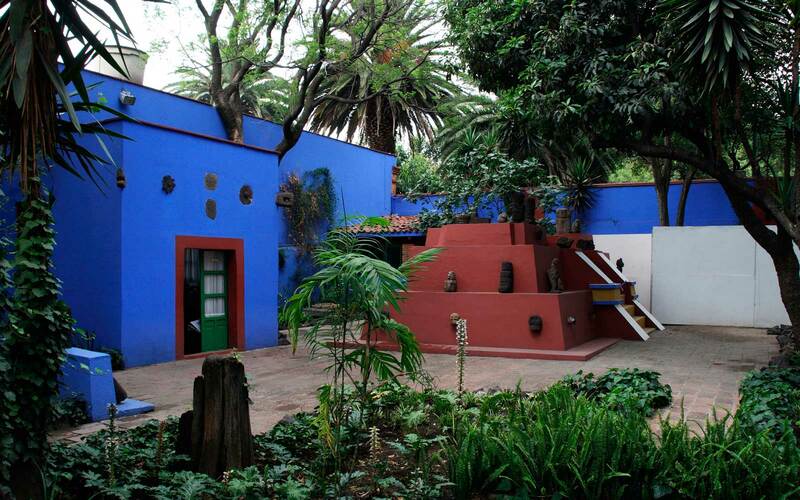 The artist and her husband, Mexican muralist Diego Rivera, eventually bought her childhood home and transformed it into the Casa Azul, or the “Blue House” — a place where they would welcome visitors and activists from around the world (including Leon Trotsky and his wife), raise exotic animals, and nurture inspiration for their art. Contrary to the belief held by some that Kahlo was primarily a self-portraitist or a painter of the personal, art historians insist that her art was radically political and tied to much a larger understanding of the context of Mexico City. “Just like Kahlo’s paintings, just like the way that she dressed, it’s a very intentional expression of her love of Mexico. 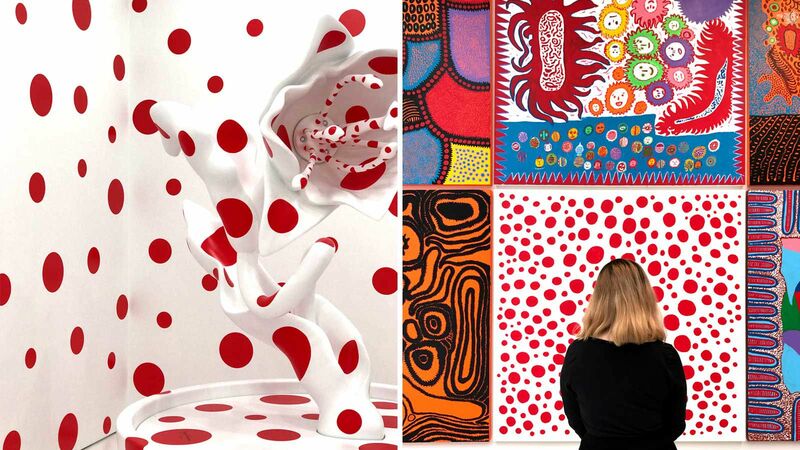 And it’s also very avant-garde,” said Adriana Zavala, an expert in Mexican art history at Tufts University in Boston and a curator of the 2014 exhibit of Kahlo at the New York Botanical Garden. “She was very consciously always reinventing and inventing,” said Zavala. The city exerted an almost human influence on the artist, combining both the radical transformation of its political time and the bohemian culture that characterized her neighborhood. Using these two strong and sometimes opposing influences, Kahlo created some 200 paintings over the course of nearly three decades, notable for their bright color, decorative patterns, and raw, emotional character. Visitors to Mexico City today can still find the same spirit that inspired Kahlo in the architecture, museums, and galleries of the Mexican capital. Given the artist’s international fame, her home and neighborhood have been meticulously preserved, allowing a glimpse into the atmosphere that would have permeated her daily life in Coyoacán. Mexico City at large continues to inspire a generation of contemporary artists, spawning the creation of pop-up galleries and new exhibitions where Mexican painters, sculptors, and photographers continue to push the boundaries of what it means to be an artist and what it means to be a Mexican artist. “One of the things that remains exciting about Mexican art and architecture is its formal boldness,” Kathryn O’Rourke, an architectural historian who has written a book on modern Mexico, told Travel + Leisure. 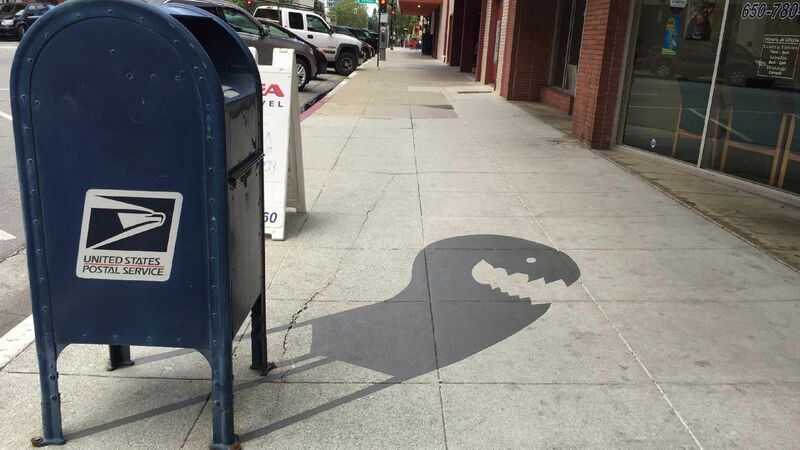 “It’s inventive, it’s daring: The art, like the city is like that,” she said. At the time Kahlo was born in Coyoacán, it was still on the outskirts of Mexico City, not fully integrated into the chaotic pace of urban life. The suburb was bohemian and quiet, known for its colonial-style architecture. “Mexico City is as cosmopolitan a city as anywhere else,” but Coyoacán “feels like a little town,” explained Zavala. Travelers can visit the Casa Azul, which has been transformed into the Museo Frida Kahlo, a museum dedicated to her life and work. Visitors can walk through the rooms and garden where she spent her childhood and where she would be confined to bed for long periods of time after a pole impaled her pelvis in a violent bus accident at the age of 18. Casa Azul was the setting for periods of great joy and great suffering for Kahlo, and the marks that she and Rivera left on their home remain evident more than 60 years after her death. 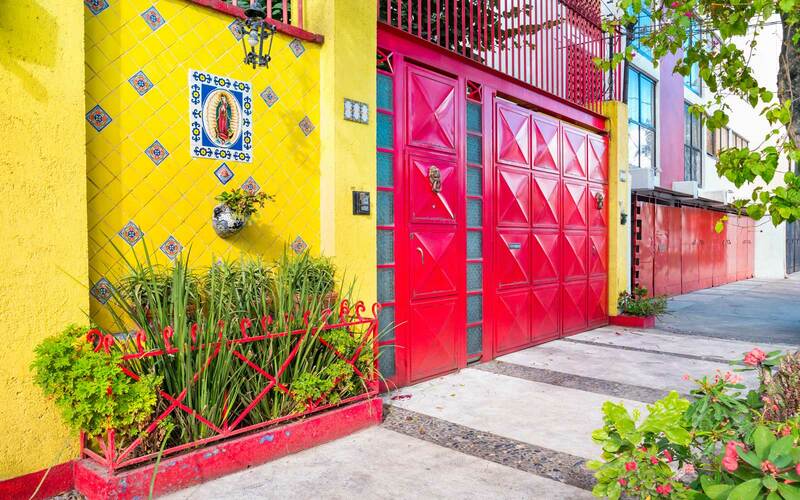 From the paints left in her palette to the garden that she helped cultivate, Frida’s traces are everywhere. Down the street from her home sits the central “plaza,” or main square, as well as a 16th century Franciscan cathedral called the Parroquia de San Juan Bautista. Zavala also recommended stopping a nearby square called the Jardin Centenario, a garden that honors the 100th anniversary of Mexican independence. Beyond the handful of designated attractions, visitors should wander the streets of the neighborhood to see the bright reds and blue hues of colonial buildings that characterize the architectural style of Coyoacán. The neighborhood, and her home in particular, were places of rich creativity for Kahlo, and Coyoacán continues to provide a sense of respite from the often hectic ambiance of the rest of the city. 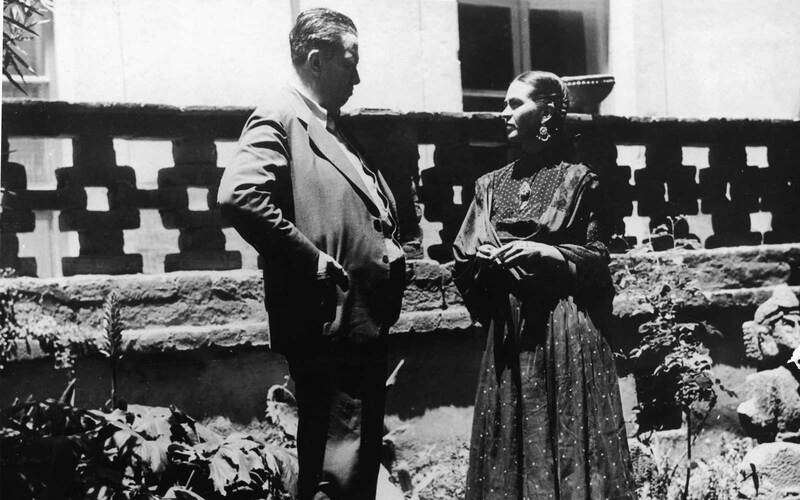 Coyoacán may have been quiet compared to central Mexico City, but Kahlo was living and working in a city that underwent major transformation and modernized rapidly over her lifetime. As with many early 20th-century cities, urbanization took place rapidly, expanding the boundaries of the city. With the end of the Mexican Revolution in 1917 and the ascension of new leadership, a host of government-sponsored building projects began, including federal housing and healthcare centers. As the title suggests, the 1932 painting depicts Kahlo on the U.S.-Mexican border. On the Mexican side sit what appears to be historical ruins, sculptures, flowers bursting through the earth — life and history. On the American side everything is mechanic, with a trail of smoke coming from a “Ford” factory obscuring the American flag, seemingly representing industrialization. “She seems to really make personal what is happening at a much broader cultural level; she both channels it and becomes a kind of expression of it,” said O’Rourke. Visitors can see the evolution of her work at the Dolores Olmedo Museum, which houses the largest collection of Frida Kahlo works in the world, according to the Mexico Tourism Board. The nearby Paseo de la Reforma, a wide French-style avenue that cuts through the middle of Mexico City, offers views of some of the modern architecture that helped shape the metropolis in the 20th century. 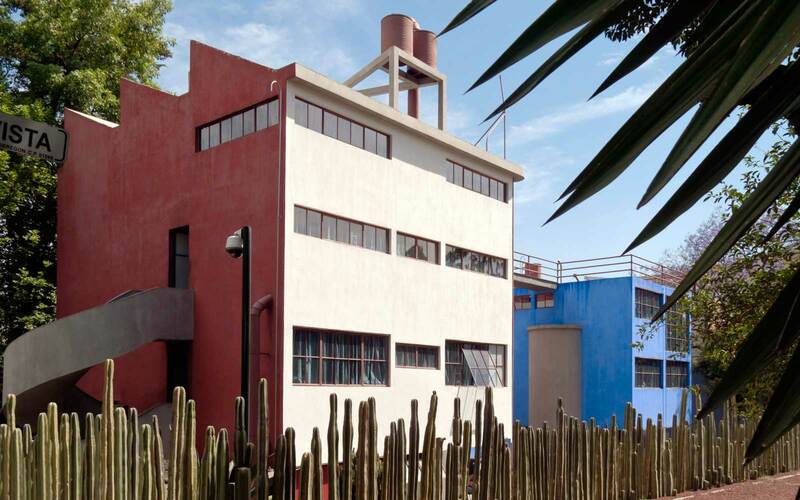 In 1932, architect Juan O’Gorman built what is now the Museo Casa Estudio Diego Rivera y Frida Kahlo, a studio comprised of two separate workspaces, one for each artist. Throughout this period, Kahlo and Rivera’s relationship grew ever more strained, particularly following a miscarriage that took place in the early 1930s. Throughout the 1930s and until her death, Kahlo continued to broach ever more taboo subjects, including a rendering of that miscarriage. Depicting themes like miscarriage and mutilation was an audacious artistic choice, as they were subjects almost never discussed at that time, according to O’Rourke. “That’s a radical thing. And it’s still radical,” she said. That penchant for pushing boundaries lives on in the current art scene of Mexico City, where the avant-garde still thrives. Galleries like Galería OMR and Biquini Wax offer a platform for young, usually local, artists to express themselves in a public forum. Biquini Wax is a small artists’ collective that aims to blur the line between personal identity and art, the New York Times reported. Without referencing Kahlo directly, the ideas that the collective expresses — of identity as a form of creative art, of embracing the specificity of Mexico — hearken back to everything that she represented. In these galleries then visitors can find the legacy of Kahlo in something more than a kitschy reproduction of her likeness. They can see the radical spirit she embodied which would live far longer than her 47 years.